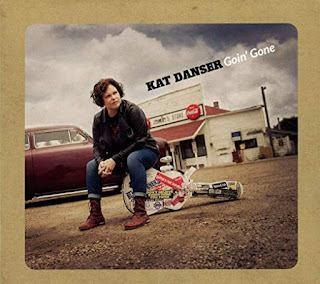 I just had the opportunity to review the most recent release, Goin' Gone, from Kat Danser and I really like it. Opening with title track, Goin' Gone, Danser who leads on vocals and guitar has a thick bluesy/country style and has surrounded herself with a tight group of musicians including Steve Dawson guitar and pedal steel, Jeremy Holmes on bass and mandolin, Gary Craig on drums, Jim Hoke on harmonica and sax and Matt Combs on fiddle and mandolin. Voodoo Groove delves even into a country style with healthy guitar riffs and rich vocals. Dawson gets the pedal steel wound up on Memphis Tennessee with light harmonica soloing by Hoke. Danser's vocals are consistently solid track to track and the release is nicely balanced. Sam McGhee's Chevrolet Car has a cool blend of country and blues with country style fiddling by Combs and powerful vocals by Danser over tight drum rhythms by Craig. Haunting slide work by Dawson on Mississippi Fred MacDowell's Train I Ride gives it a special amount of pepper over the sassy vocals of Danser. This track has great feel and spaciousness. Very cool. Wrapping the release is easy paced, Time For Me To Go with only acoustic guitar, light electric guitar, bass and brush drums supporting Danser's vocals as she winds down. This is a very cool release with crisp energy and solid melodies.